In 2014, not long after being elected, Pope Francis invited representatives of 100 different grassroots organizations from 60 different countries around the world. Day laborers, street dwellers, urban recyclers, farmers, domestic help, fishermen and young observers all gathered at the Vatican to begin a dialogue between movements and the Catholic Church on many levels. There have now been three consecutive gatherings in 2015, 2016, and a national 2017 meeting in Modesto, California. The numbers have grown to nearly 700 organizations and social justice advocates from 12 countries. In his address to each of these meetings, Pope Francis did not mince words as he spotlighted the scandal of poverty in the world, where land for cultivation, adequate housing and the dignity of work are ever more distant for the majority of people. The aims of these unique gatherings are to give a voice to those normally in the shadows so they can speak through their experiences; to accompany and encourage them to take a lead role in their own progress; to identify structural causes of poverty and inequality and seek inclusive alternatives to current models; to build a relationship between various organizations and the Catholic Church, helping them discover the value of solidarity in the common dream of a society that respects the dignity of all its members. The question from the Gospel of Luke (10:25–37) then reverberates in our ears: “Who is my neighbor?” Who is that other whom we are to love as we love ourselves? 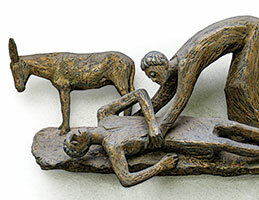 Jesus responds with the parable of the Samaritan, who didn’t pass by the injured man as the priest and Levite did, but instead acted with compassion, bound his wounds, carried him to the inn and provided for his care. This parable illustrates that compassion, love, is not a vague sentiment, but rather a concrete action, a commitment to draw near to others to the point of identifying with them. Like the first two people before the Good Samaritan, today our society often looks the other way from those who suffer without touching them. He cites the tremendous upheaval in economic, familial and cultural life caused by globalization that now “requires the creation of major new structures of social justice designed to mitigate the consequences that have devastated so many sectors of the human family.” Market forces have elevated efficiency and productivity as the absolute values in human life, as opposed to objective values that transcend the market and are most important in human relations: truth, justice, love, the dignity and rights of all. The daily news reports, he acknowledges, can lull one into thinking that nothing can be done on a larger scale, so I’ll just take care of myself and my family, and let life go on as it will. “A lot!” says Pope Francis. “I would even say that the future of humanity is in great measure in your own hands, through your ability to organize and carry out creative alternatives, through your daily efforts to guarantee the three “Ls” (labor, lodging, land), and through your proactive participation in the great processes of change on the national, regional and global levels. “If the people behind the statistics are not recognized,” he said, “the world can yield to the temptation of discussing hunger, food, violence as concepts without reference to the real people knocking on our doors today. engaged in the process of change — a transformation of structures that produce poverty into ones that support the healthy development of people and communities.